This post is the second in two-part series of posts on some ideas I have been exploring over the past year in a half through in my Graduate Program. If you missed part 1, you can find it here. These ideas originate from a project I completed, Multimedia Literacy in the Elementary Language Arts Classroom: A RESOURCE FOR EDUCATORS. So often I hear people talking about educational technology without thinking about the why. 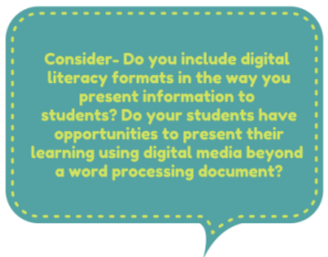 This series of posts focuses on why I believe we should be moving to teaching not just literacy, but multimedia literacy in schools. Honouring and engaging in multimedia literacy in classrooms helps to create more student-centered environments. When educators see the value of multimedia literacy they can better communicate with and help their students recognize their own strengths and challenges with regards to different modes of literacy. According to The New London Group (1996), wh en learners juxtapose different languages, discourses, styles, and approaches, they gain substantively in metacognitive and metalinguistic abilities and in their ability to reflect critically on complex systems and their interactions (p. 69). Students that are aware of their strengths and challenges are better able to make decisions when it comes to communicating their understandings in class. At the same time, educators should also push students out of their comfort zones to challenge themselves and their understandings. Mike Ribble is a well respected expert in the field of education with regards to digital citizenship. 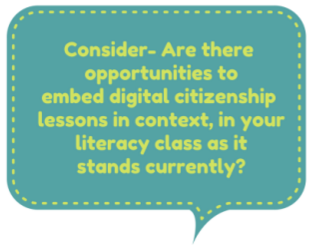 Ribble (2013), proposes a model to move forward in teaching digital citizenship in schools. His framework for digital citizenship includes 9 elements: digital etiquette, digital access, digital law, digital communication, digital literacy, digital commerce, digital rights and responsibility, digital security and digital health and wellness. These elements fall into 3 categories: respect yourself/respect others, educate yourself/educate others and protect yourself/protect others. Ribble cites, the International Society for Technology in Education (ISTE) as providing guidance by updating the National Education Technology Standards (NETS) for educational leaders, teachers, an d students. The NETS integrate educational technology standards across all educational curricula and are recognized in the United States, and various countries worldwide. Next Post The Best Makerspace Is Between Your Ears!